Some days are good. 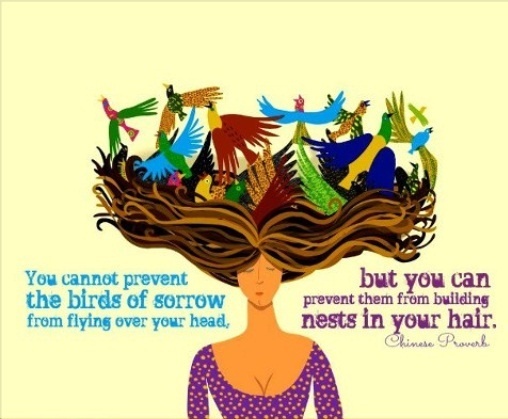 Some days it feels like four generations of birds have built a mansion on top of my head. The weight can feel unbearable. I woke up from my induced coma on April 7th. They had reduced my sedation the prior Saturday but I must have been making up for all the sleepless nights my kids put me through. I was extubated on Monday and apparently started waking up but I do not remember anything prior to that Tuesday. I remember Marc coming close to give me a kiss and when he backed away I told him he had four eyes. When my brothers came to visit me I was absolutely convinced that they had died their black hair blue. I saw little floaters in the air that I stated “looked like tiny, flying penises.” Weird things happen when you wake up from a coma. I had no idea that I had been asleep for four days. When I read other accounts of TSS and ARDS I feel blessed that it was only four. Many people are in comas for weeks if not months. I spent a bit of time alone in the hospital once I was awake. Everyone was balancing the kids, working, and catching up on some sleep now that they knew I would be okay. I had cards and care packages to look through but my lifeline back to the world was my phone. It was very frustrating that it was now too heavy for me to lift. My thumbs felt like they were three times their size but I fumbled my way through taking off my phone case. I hoped that would make it easier to lift. It didn’t. I started physical therapy in the hospital. Brittany, my PT, was absolutely amazing. She was one of the many angels that God sent to me. 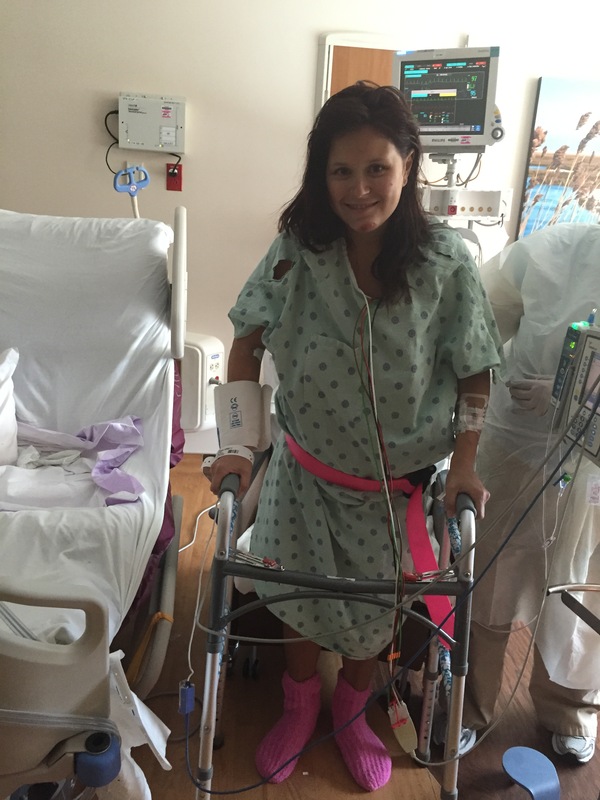 The first time I walked again was scary. How was it that at 31 years old I had to learn to walk again? I sent that picture to my parents saying “look what I can do!” Can you imagine what it was like for them having to watch their daughter learn how to walk for the second time? I asked my doctor to put in an order for me to shower. I had to sit in a chair and was assisted with the entire thing. It was the first time I looked at my body, which was 13 lbs lighter and frail. I studied the scrapes on my cheeks and chin. It was my body but I no longer knew it. I cried for a long time. I was discharged Friday, April 10th. I was sent home with a picc line in my arm, a walker, and a bedside commode. I was so excited to see my boys. They punished me for not being there. They ignored me and my heart shattered into a million pieces. That first night I was in so much pain that I got my walker and shuffled onto the couch. I watched infomercials until I finally fell asleep at about 4am. At 5am I had to wake up for my IV antibiotics. Sunday, April 12th I ended up back in the ER. The pain in my ribs was making it too hard to breathe. My doctor was afraid of a pulmonary embolism. I hooked up my antibiotic and off we went. Marc and I watched the Masters in our little room. I still had fluid in my lungs and often needed to cough but whenever I did the pain would sear through me. I tried my best not to cough. Luckily the CT scan showed no PE. It was ruled pleurisy and I was given some Percocet. I know that Jesus loves me because he gave the scientists the knowledge to create Percocet. I was shocked when three months later I realized I had definitely not kicked anything anywhere. I have days when I am so tired it takes everything I have to just get out of bed. Moments when my legs feel so weak I am afraid they might give out. For about two months my hair fell out at an alarming rate. I have maybe half the thickness I used to. My eyelids always feel heavy. Most of the time I feel like I am walking around in a bit of a fog. If I am having a good day and I try to do too much I pay for it with a crushing fatigue that lays me flat. What is wrong with me? Am I trying to get attention? Have I developed some psychological need for it? Am I just being a big baby? These are the things I feel sometimes even though my doctor assures me this is normal. Other survivors say the same thing. And yet, it does not make it one bit easier to deal with. I have two little boys that I cannot even chase around my living room without feeling exhausted and breathless. My workouts used to consist of running one mile, 30 minutes of HIIT training, and finishing with a one mile run. Now I have more days than not where I have to say I am just too tired to even go to the gym. Let me take a moment to mention how amazing my doctor is. His name is Dr. Nadeem Inayet. He is one of those angels that was sent to me and is only dressed as man doing God’s work. After saving my life and one follow-up visit he could have been done with me. Instead he came and watched me work out last Monday so we can figure out what the best kind of exercise for me to do. He is helping me figure out what supplements will be the best to help me recover. He keeps me sane by reminding me that it will get better. It will just take time. He is a genius so I believe him. Dr Inayet and Marc developed a bond when I was sick and left as brothers for life. I am really lucky because then I am him sister-in-law by default! I am in talk therapy to try to work through the emotions that sometimes feel too big for my body. I have an unlimited supply of guilt. I am not the mother or wife I used to be and most days I feel fairly useless. Marc tells me, “but you are here.” I know that is the truth and I do love him so for saying that to me…but sometimes it does not feel enough to just be here. I want to do the things I used to do and be the person I used to be. This is a test in patience and I am afraid I am failing; but, everyday I put one foot in front of the other and breathe in and breathe out. I do not forget how close I was to not being able to do those things. If you are interested in learning more here is a link that describes life after TSS and here is a link for post ARDS. There are many well-meaning people who say to me, “I’m glad you are feeling better.” Although I appreciate the sentiment ad support I do have to say one thing: Better is a relative term. Yes, I am better than I was in April but I am still oceans away from who I used to be. Take care of you! My thoughts and prayers are with you !